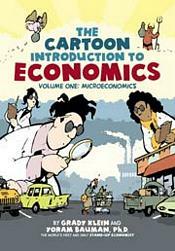 Grady Klein , Yoram Bauman, Ph.D.
Yoram Bauman, the world’s first and only stand up economist, just published The Cartoon Introduction to Microeconomics. Worth is thrilled to offer this bundled for free with all of their Principles of Microeconomic texts, as well as several others. Please see a listing including ISBNs below. If you are not familiar with Yoram’s work or just need a good laugh this is a video of his standup routine.